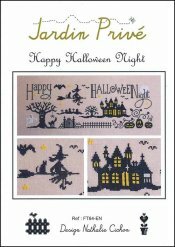 Happy Halloween Night [W1016] - $10.00 : Yarn Tree, Your wholesale source for cross stitch supplies. Cross stitch pattern by Jardin Prive. Stitch count 223w x 80h. Stitched on #4178 Vintage Belfast Linen country mocha.